Some people just don't know how to look after their money. Click here to play! Richard Fortuneswealth III is just such a person. Oh sure, he knows how to play the stock market and he has a great nose for investing in the right business ventures. He just has no idea how to remember a simple combination for his safe! Worse yet, he refuses to try modern methods such as retina detection or voice recognition. His reason is that such methods can sometimes fail to accurately detect your retina or voice, but that hardly seems like much of a problem when he cannot remember his safe combination for more than a few seconds. Due to Mr Fortuneswealth's forgetfulness, he has now lost access to the majority of his fortune. That's where you come in. 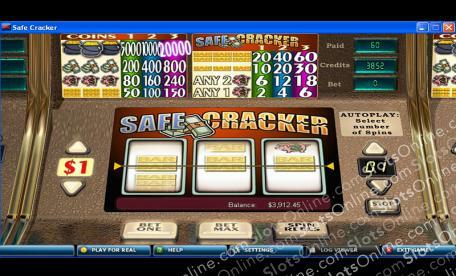 In the Safe Cracker slots, you are an ex-criminal master Safe Cracker employed by Richard Fortuneswealth III to open up his safe. With his peculiar safe lock resembling a 3-reel classic slot machine, you will need to line up matching symbols on the payline to unlock a little of his wealth at a time. If you can manage to get 3 pots of gold on the payline, you'll be able to get hold of his entire fortune! Play the Safe Cracker slots now, and benefit from the terrible memory of Richard Fortuneswealth III (soon to be knighted).